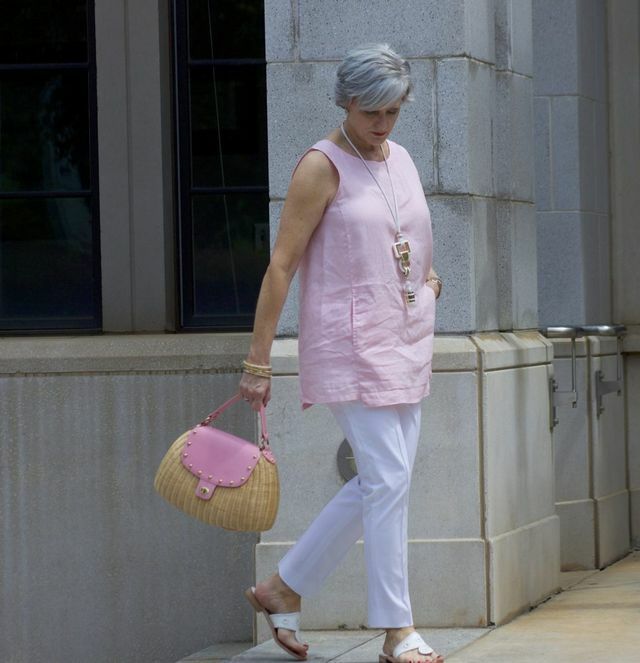 I hear all the time that fashion at all ages should be effortless! But for me is not that easy, especially when the season is changing. I find myself wondering if my clothes are still in style or if they suit me or I should buy other clothes, just to be in trend. Casual is my style, but ageing makes me wonder what kind of casual outfits for 50 year old woman I should wear. Searching on the internet I found many inspirational images with casual outfits. If you wonder ‘am I too old for this?‘ when looking for various jeans or pants designs, I suggest you to get rid of the stress surrounding shopping. This year fashion will not age you, if you follow some style tips. Here and now you’ll get an insight on how to hold on to your personality and put your physical assets in evidence. 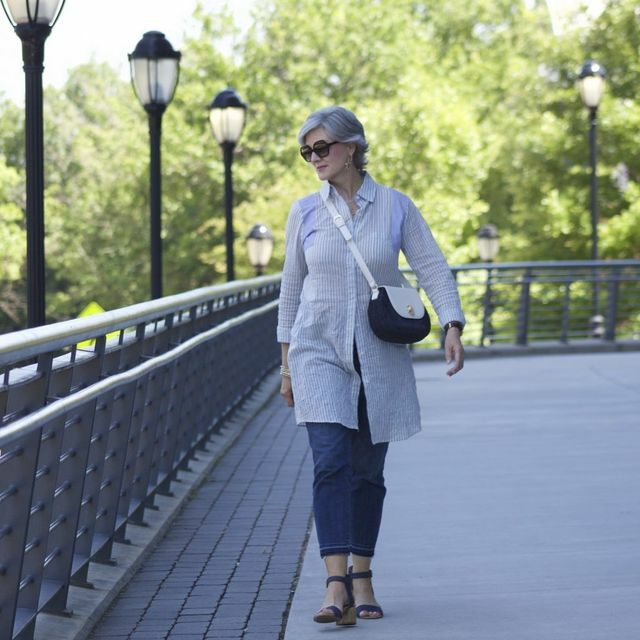 Fashion for women over 50 has become more versatile than you think. Casual style doesn’t consist anymore in baggy clothes and neutral colored boring accessories. Realizing what you have to eliminate and then, incorporate into, your wardrobe will not be a struggle anymore! Each age group has its own dilemmas. Trust me, casual outfits for 50 year old woman need just a little planning. Mix matching different shades can so easily be learned as well as the way you associate your silhouette with various tailoring designs. Looking fashionable should be your new year’s resolution! 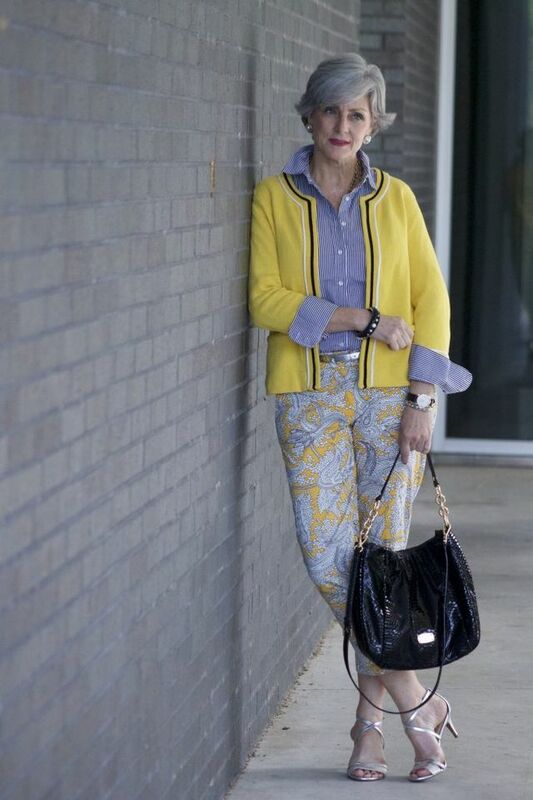 Let these real trendsetters open the door for change and convince you that you only need a few essentials to be chic over 50. 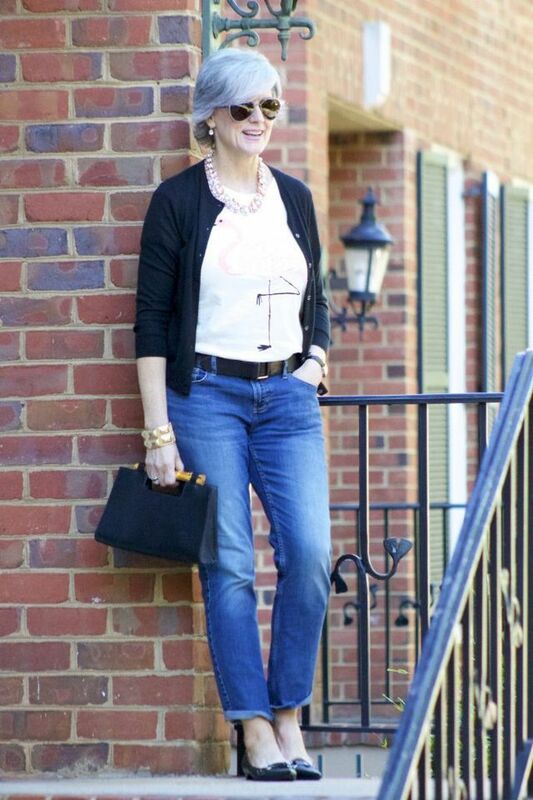 I’ve compiled a fab collection of looks for 50 year old woman in order to create a casual style. In conclusion, striped or printed dresses, midi skirts and cropped or flared pants are more fashionable than ever. These women’s clothes allow you to build up diverse and inspiring casual outfits. 1.Break out of the style rut and feel stylish at the same time with mid-length flared skirts. A white shirt will send the message that you mean business. 2. Reconsider your attitude towards investing in a denim shirt. 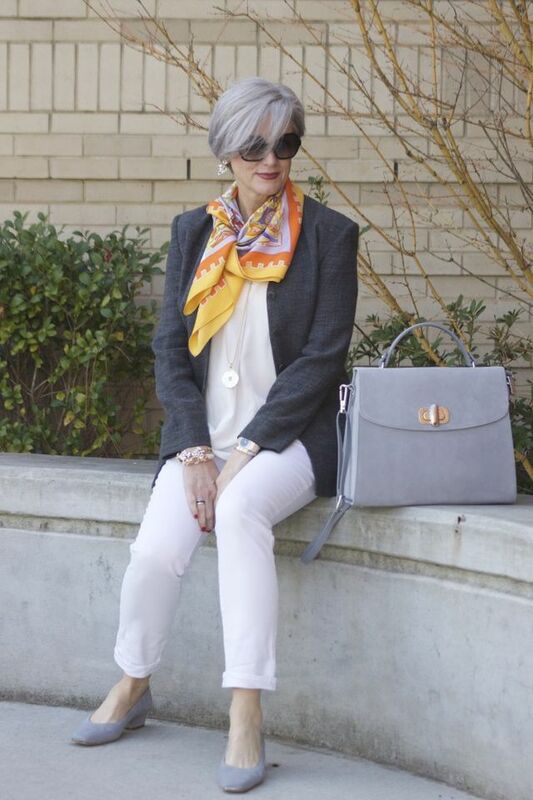 I can assure you it is the real deal to put together modern and stylish casual outfits for over 50. 3. See this lively colored jacket in a combo with a midi skirt and lace-up boots that add length and a fine line to your silhouette. If purple is not your color think of beige and maybe a classic black pencil skirt outfit or a black leather pencil skirt outfit ideas. 4. Team up a vibrant colored turtleneck with a nice block-colored dress to keep things simple and still create the impression of an adult and elegant woman. 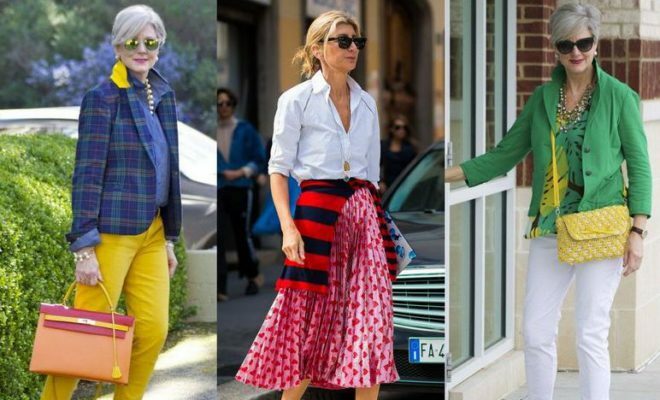 Find these inspiring summer casual work outfits for 50 year old woman. 5. Shearling jackets continue to dominate the trends. Pair them with straight jeans and definitely high-heel boots. The heels will add to your height and create the effect of a slender silhouette. 6. 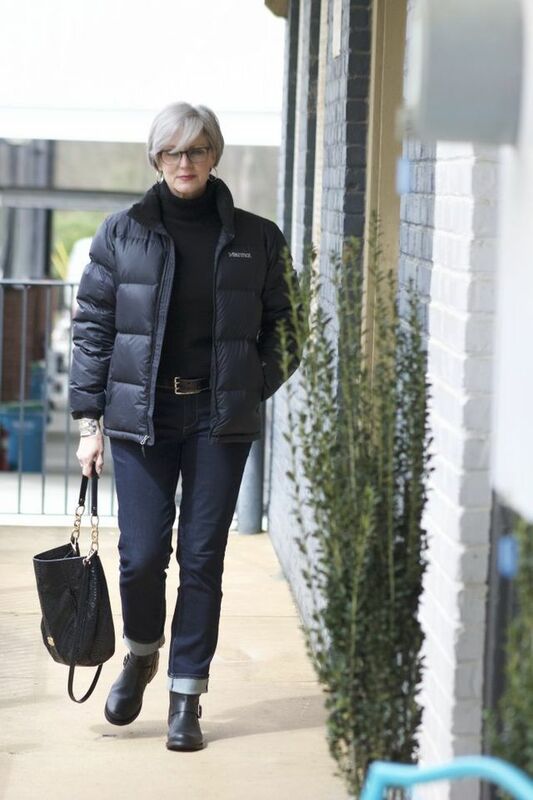 Fashion over 50 is not only about trends, I know that you say you deserve comfort. 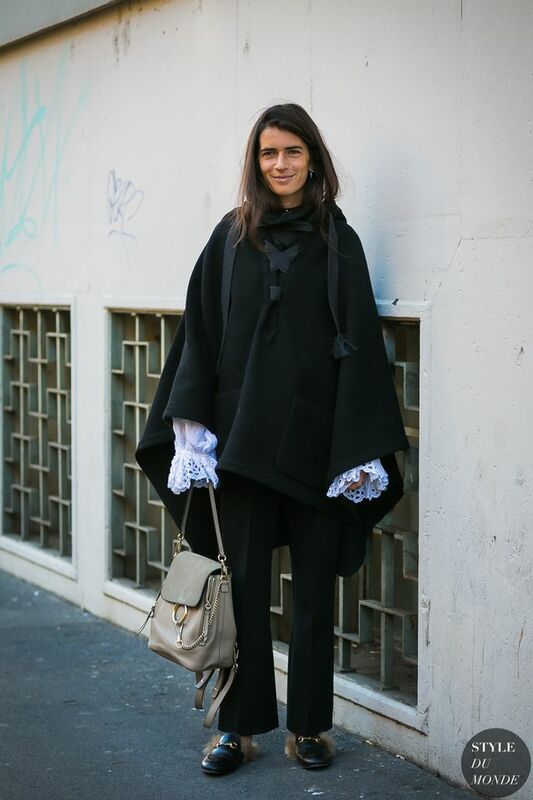 You’re right that’s why you should take full advantage of the poncho craze and loafer trend. 7. Forget about grandma style! Animal print is voguish at every age. Put on a nice simple white shirt, a printed blazer, these bootcut super-flattering cropped pants to flash some skin and pointy-toe sandals. The secret to success is to stop at one animal printed piece! 8. Bootcut cropped pants with fabulous floral or baroque prints send the message of ‘I know I still have it’. Moreover, this tailoring design suits all body shapes. 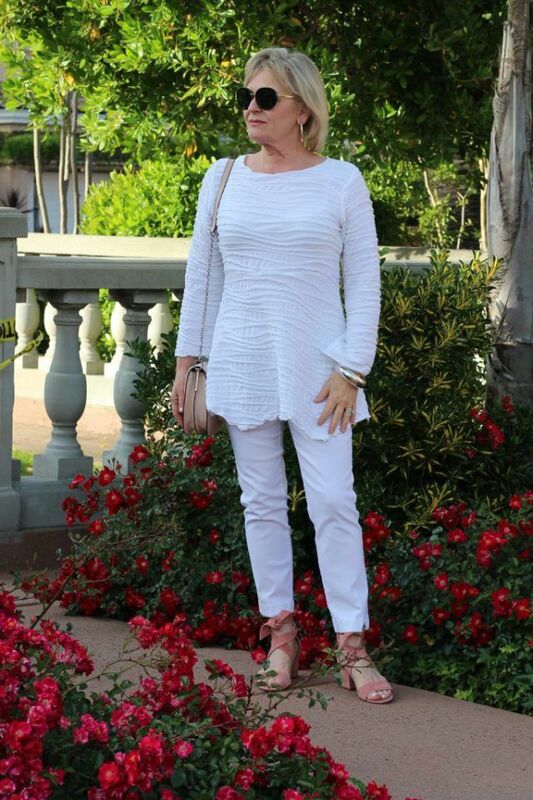 Keep things simple with a matching white T-shirt or blouse and fine colored sandals. 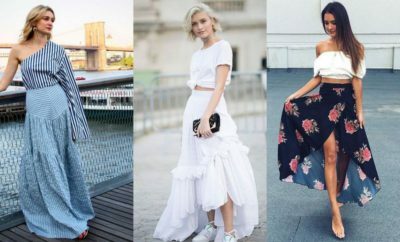 Try to copy these casual outfits for summer and you’ll feel stylish. 9. During winter, swap your boring clean cut tweed jackets for a similar medium-length puffy jacket with furry hoodie. This outerwear design allows you to wear your favorite straight jeans and booties. For women winter outfits, try these casual booties to wear with jeans. See that hat? Now that’s the extra you need for uniqueness! 10. Fashion for 50 year old woman will not age you, instead it will help you embrace your life lover side. 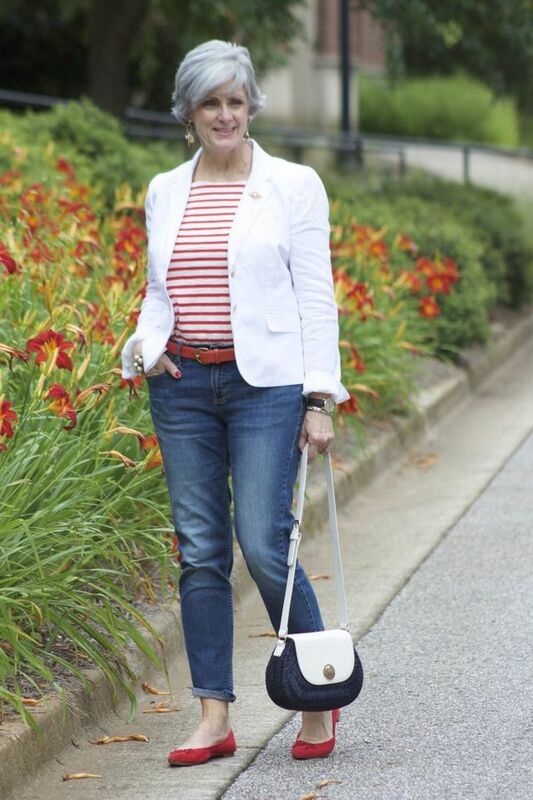 A striped, knee-length skirt, a simple black blouse and a blazer can make up the core of a summer work outfit, the red necklace and tote will only spice things up. 11. 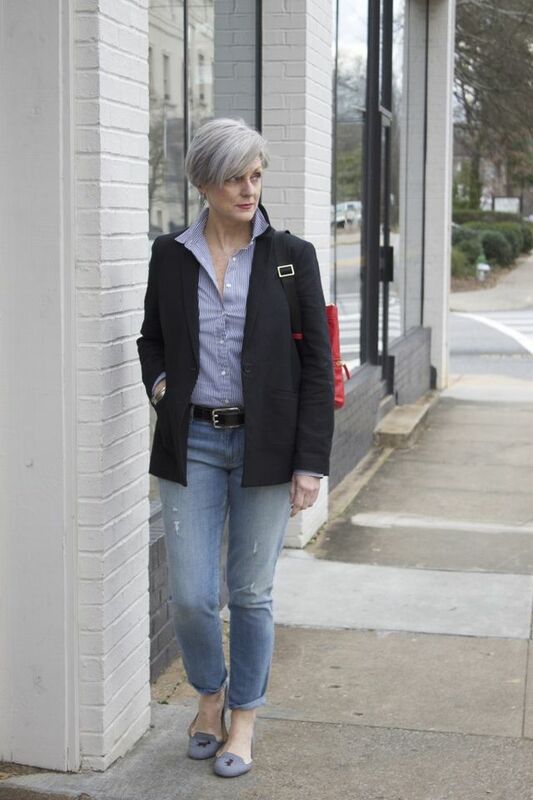 How should a 50 year old woman dress if she is still drawn to modern and youngish trends like roll-up jeans? Here’s the example, I’ve selected for you! 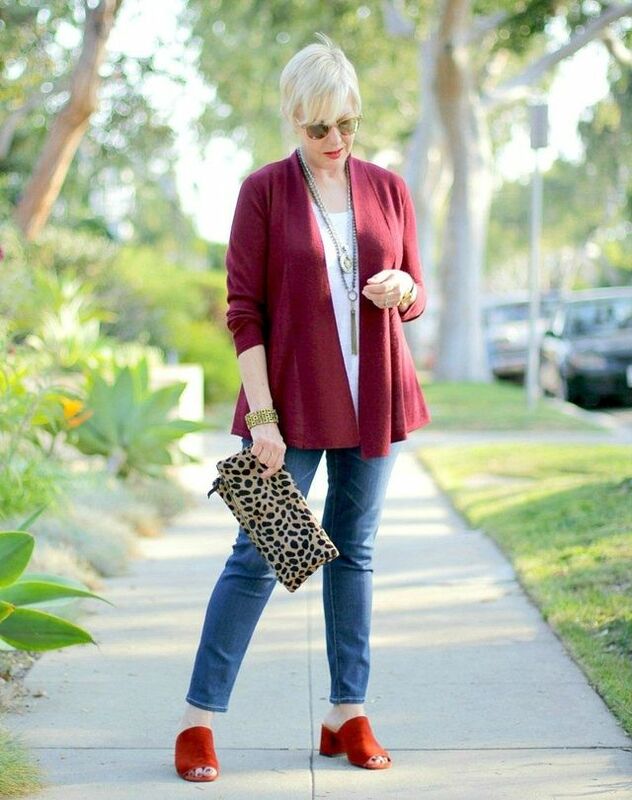 A fab cardigan, a pair of suede booties and an oversized bag guarantee the mature and elegant factor. 12. 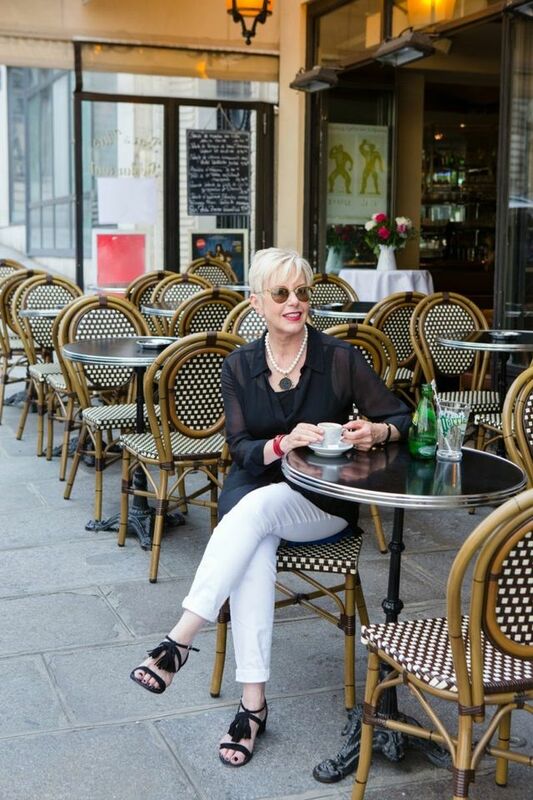 It’s time to get rid of the misconception that outfits for women over 50 are mostly boring and lack any creativity! Let me show you how to take things to the next level. This tie waist cardigan, boot cut trousers and chunky-heel boots will turn you into a trend- and also body-conscious woman. 13. Wait a second! I know that you wanted to scroll down the page without stopping at this image. 🙂 Give me a minute to prove you were wrong! Check the white straight cut pants, believe it or not it is a ‘must’ for the summer, especially as this neutral tone is the epitome of elegance. Also, I feel the need to defend strapless tops especially if you have a beautiful skin, why hide it! 15. 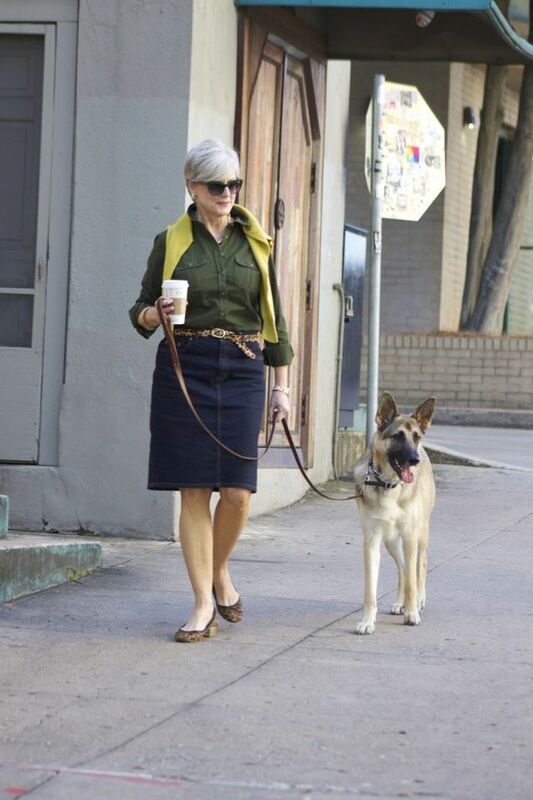 Casual outfits for women over 50 are spotted all over the internet. It seems that dropped-shoulder summerish blouses should be your next style purchase. Think of a set with culottes or wide-leg pants with a nice vertical stripe print that visually lengthens your silhouette. Find here what shoes to wear with culottes if you are searching for ideas. 16. My heart goes out to you, ladies who are not afraid of flashing your eye-catching figure. These cropped skinny jeans create the perfect base to top with a floral printed summer jacket and wedges. There’s always a way to stick to your style crushes. 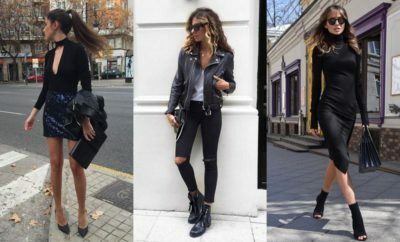 🙂 If you are that skinny you should see also my trend report about how to wear skinny jeans with boots. 17. Confidence is everything! A pair of nice boot cut cropped jeans are the perfect start, then add printed blazers in subtle black and white tones. While metallic shades are not recommended in excess these silver slide sandals add just a touch of glamour to your set. 18. Is there an inner critic that won’t allow you to make dramatic changes in your casual summer outfits with jeans for over 50? Now, let me silence it for good! Juggle with transparency in a stylish and sleek way. Put a sheer shirt on a simple black tank top, go for neutral colored pants and minimalist yet trendy fringe sandals. Try this classy summer going out outfit. This would be the perfect outfit if you don’t know what to wear on a date for drinks. 19. Do you have the tendency to simplify your wardrobe and stick to a few favorite pieces. That’s ok! 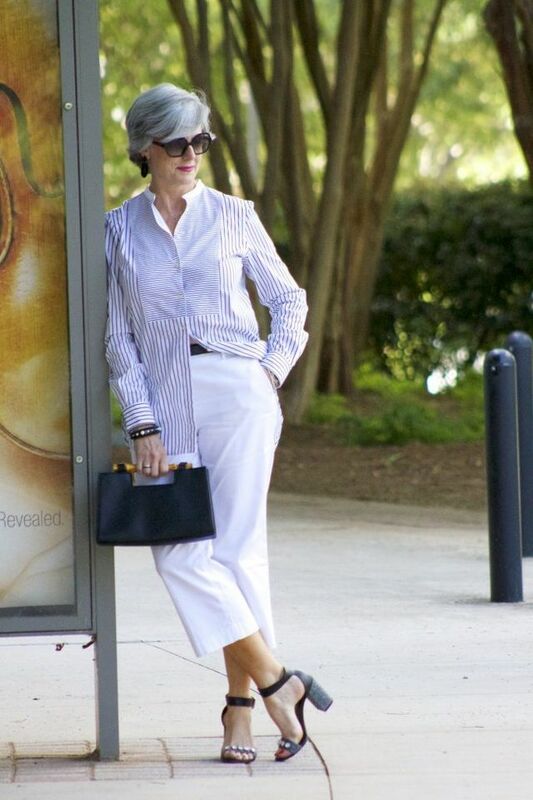 :) My advice is that you make a few conscious fashion choices like this long shirt, cropped jeans and chunky-heel sandals that are surprisingly fashionable at all ages. No doubt the cross-body bag and sunnies add a nonchalant feel to the whole outfit. 20. You don’t have to struggle to look younger? Neutral colored T-shirts are your best friends as are bootcut jeans and minimalist cardigans. Play with accessories to go from casual to elegant outfits. 21. Playful is a term understood differently by various age groups. 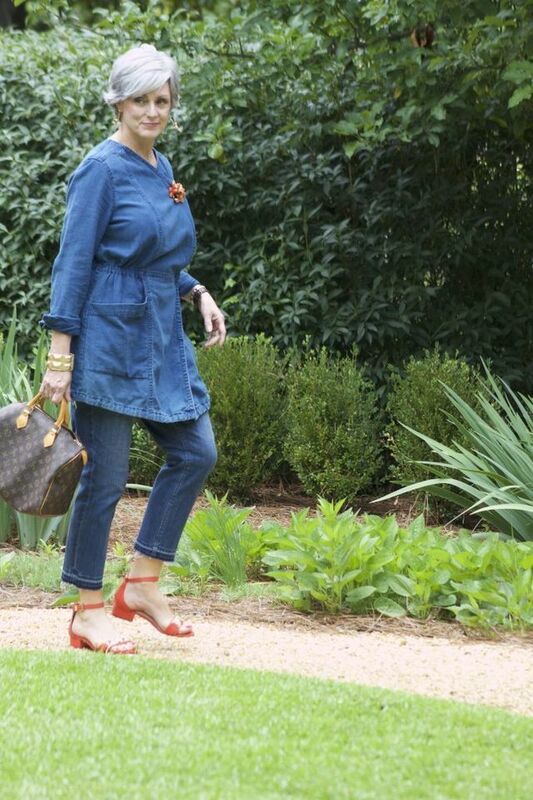 In this case, outfits for 50 year old women can be perked up with a timeless denim jacket and cross-body bags. Also black straight cut jeans and suede ankle boots are basics to mix and match with different tops. 22. If you think stylists and people in general won’t forgive you for experimentation, you’re wrong! 🙂 Acquiring a personal style is a process! Move from neutrals to new territories like earth tones. The many shades of brown are constantly ‘in‘ and will glam up a nice all white outfit. 23. It’s safe to say that the decades did not steal from the popularity of denim skirts. Distance yourself from minis and go for midis so that you can feel comfortable. Opt for a nice shirt and just an air of extravagance with leopard print heels and a belt. 24. Indeed, there are a few staples that can sum up your personal style. This finely sculpted shirt with vertical stripes is an ideal item to pair with culottes. An outfit that suits you both if you have a plus size or a slender figure. 25. Enjoy the summer breeze by sporting sleeveless tops. Get rid of your reservations when it comes to how your arms or skin will look like. The emphasis will be on your overall set and modern vibe instead of details like that. 26. 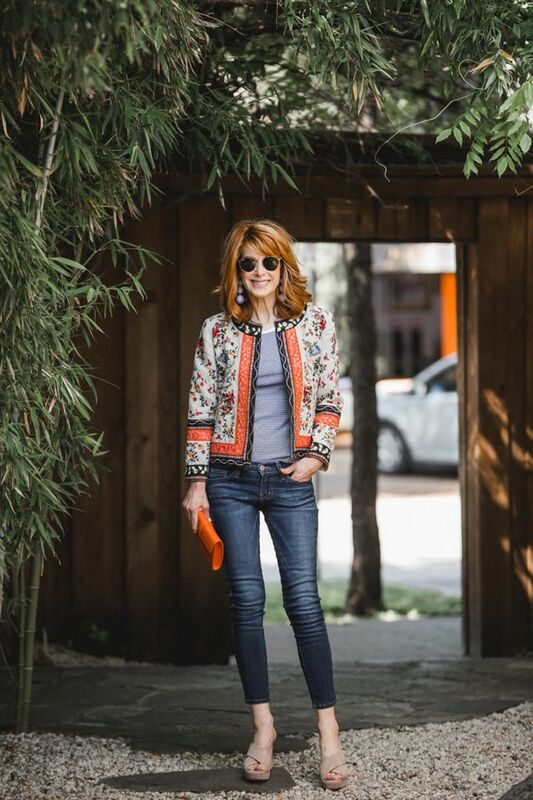 Replace jackets with versatile blazers! These statement pieces look so nice when paired with a printed top and casual straight or boot cut jeans. 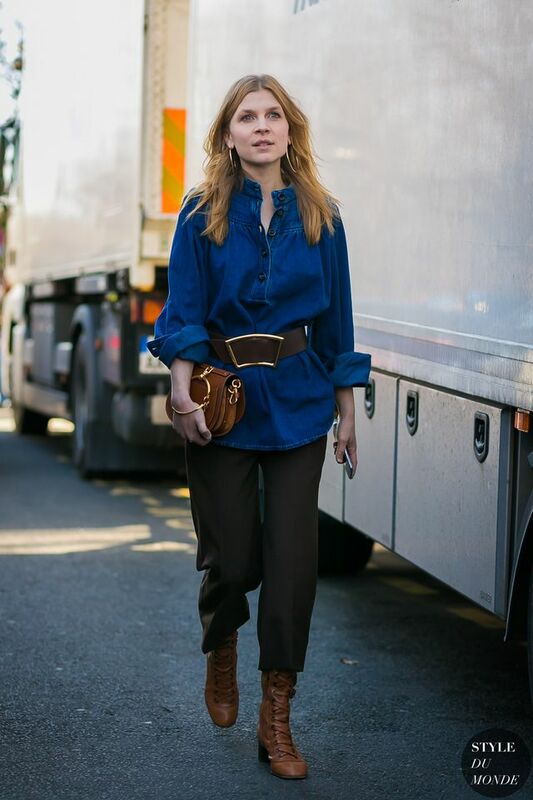 A red belt and ballet flats will make you feel that you had your share of fun when building up this outfit. 🙂 Take a look at this outfit and learn how to pair casual shoes with jeans or use it as inspiration when you don’t know what to wear on a casual date. 27. Printed pants will always help you stay in the game and avoid monotony. As you proceed through the years the size of prints should also grow. 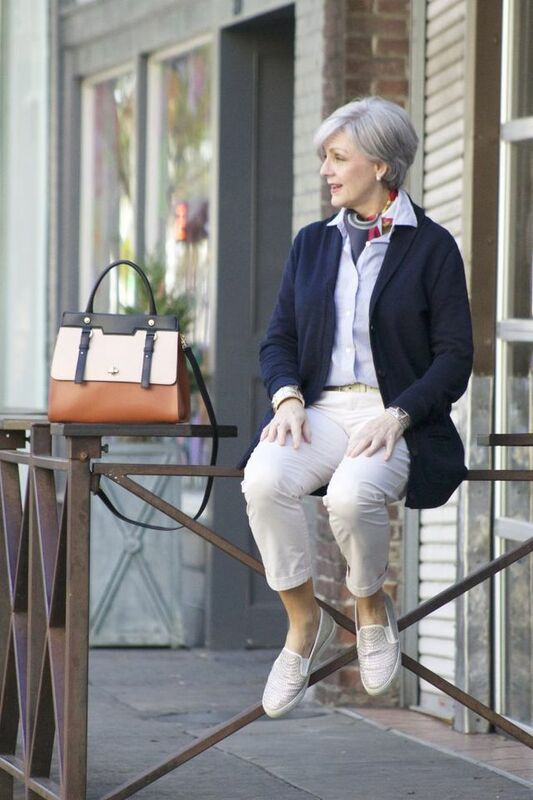 A matching color cardigan and a nice shirt will offer a laid-back air to your summer casual outfits for over 50. 28. Look as young as you really feel! In case you just can’t part ways with denim, consider these tunics and cropped pants as fashion-forward items for your everyday looks. Red sandals refine your utilitarian set. 29. 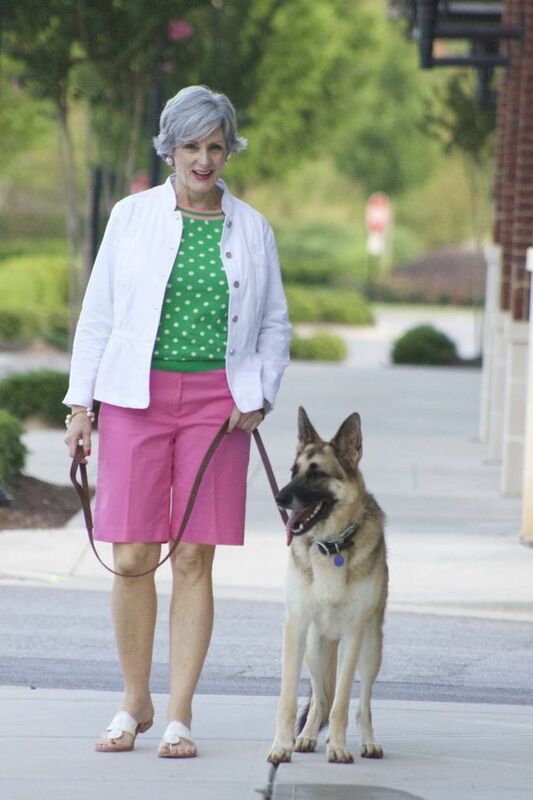 At times when you just want to say it’s unfair that fashion over fifty is chromatically limited, put on a pair of pastel or vibrant colored shorts and eventually a polka dot blouse. It’s summer don’t hide under long pants or long summer skirt outfits. Details that make this outfit still fashionable are the white jacket and slide sandals. 30. Age-appropriate fashion should not be considered a limitation. What it says is that you sport clothes that make you feel and look good. 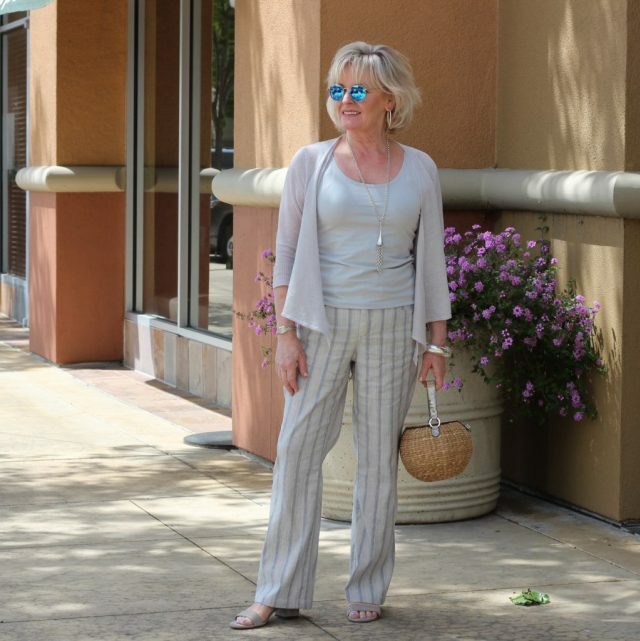 Like these neutral colored pants teamed up with a striped V-neck top that can hide all imperfections and flat sandals. 31. Invest in pastel or light colored pants you can wear all throughout the warm season. Opt for a straight cut instead of a fitting style if you are not 100% pleased with your figure. 32. This age group is about style commitment. Instead of losing yourself into the tons of pants designs, purchase a few pairs of boot cut jeans you can roll-up wear with loafers, high-heels or sandals. Also, stay in touch with your feminine side with striped shirts and cardigans. 33. Try to make an impression with your refined sets that will make younger fashionistas envy! Like this one. Boot cut jeans, a nice black cardigan, white T-shirt ad block-colored pumps you just can’t go wrong with! 34. While some outfits seem impossible to copy, this is an exception. 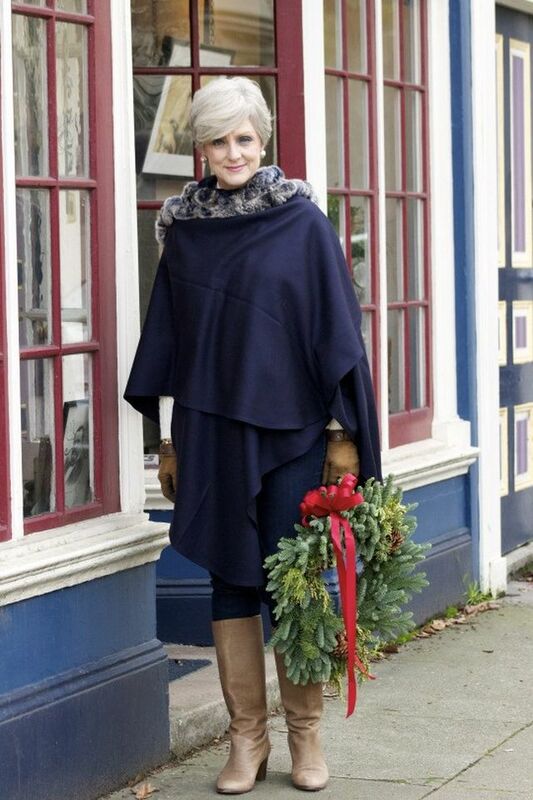 You don’t have to spend extra money only on an accessible and classy poncho in a lighter shade. This star piece will give you hundreds of admiring glimpses regardless of your silhouette. 35. Neutral colored outfits are easy to nail down. Think of pure white blouses and neatly rolled up pants, a grey blazer and matching accessories. There’s depth and sophistication in this simplicity. 36. Yellow or mustard wasn’t your thing before? It should be now! 🙂 Combine these vibrant and risky tones with black, brown or dark blue for a set that celebrates who you really are, a free spirit. 37. Chino pants with shirts are a win-win for all figure. To add a youngish and modern vibe to this simple set go for slip-ons and a nice scarf tucked into your shirt. 38. 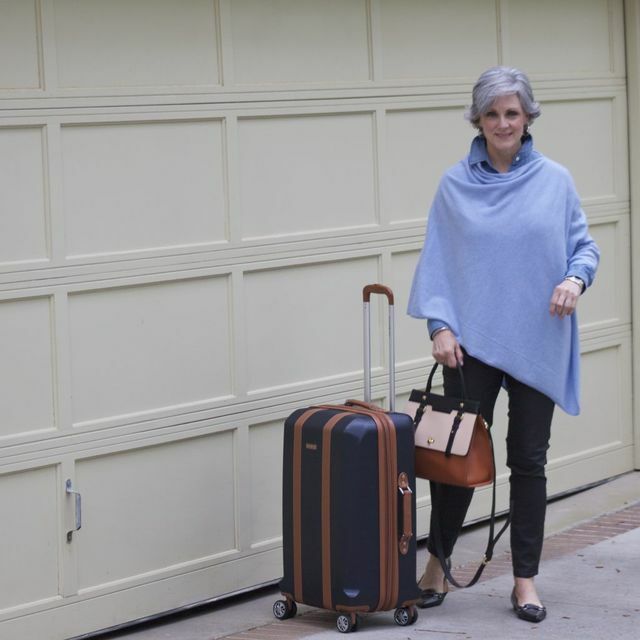 Check how accessible these casual outfits for 50 year old woman really are. 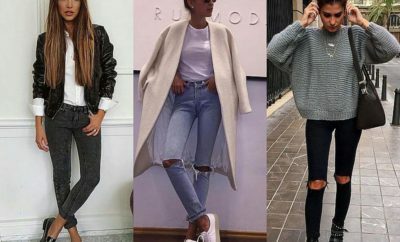 Straight jeans establish the perfect contrast with puffer coats even if you are a plus size fashionista.Whereas a turtleneck adds an utterly feminine twist to your winter set. 39. Styles for women offer 50 vary from casual to mature and elegant. Ponchos are your ticket to land on the best dressed list. You can match them with both loose-fitting comfy jeans and even skinnies if you are proud of your curves. Include this look in your collection of stylish fall outfits for women. 40. Mildly distressed jeans are ‘in’, don’t be afraid to wear them. The combo with a chic shirt and a blazer will preserve the maturity of your style. 41. Vibrant tones are more tricky to nail down at this age. However, you can opt for the softened shades of green and yellow to express your vivacious side. Also, white trousers scream summer and elegance. 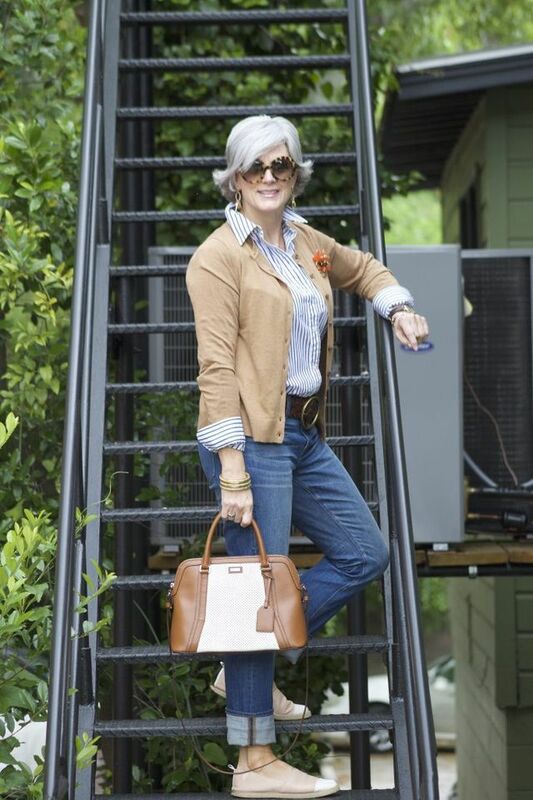 Watch these beautiful casual outfits for 50 year old woman. 42. You associate these ponchos with grandma style? Instead of wool or tweed trousers team them up with jeans and knee-high boots for a fresh and street chic vibe. Dark blue flatters all silhouettes. Personally I love these casual outfits for 50 year old woman. 43. Looking washed out is a tendency of women of your age. However, you must resist and fight lack of inspiration with block-colored cardigans in deep and fine shades like burgundy, wine, red or purple. 44. You think white will only land you in the spotlight a place you don’t really prefer at this age? 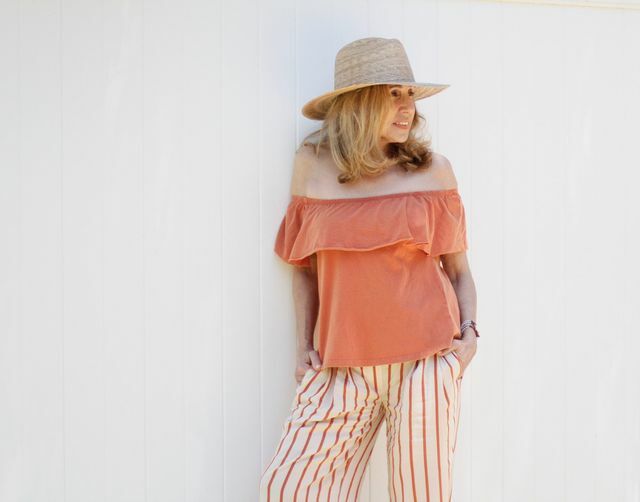 Don’t deny the elegance of this tone and find pieces like an asymmetrical top and cropped pants that bring out the best of your summer outfits for ladies over 50. 45. Stay away from shapeless and loose clothes. You don’t have to be a size 0 to look gorgeous when you are looking for casual outfits for 50 year old woman. Invest in a pair of mildly wide-leg pants with vertical stripes, a simple tank top and a cardigan. It takes only a few simple tips and tricks to step confidently into the business of styling. 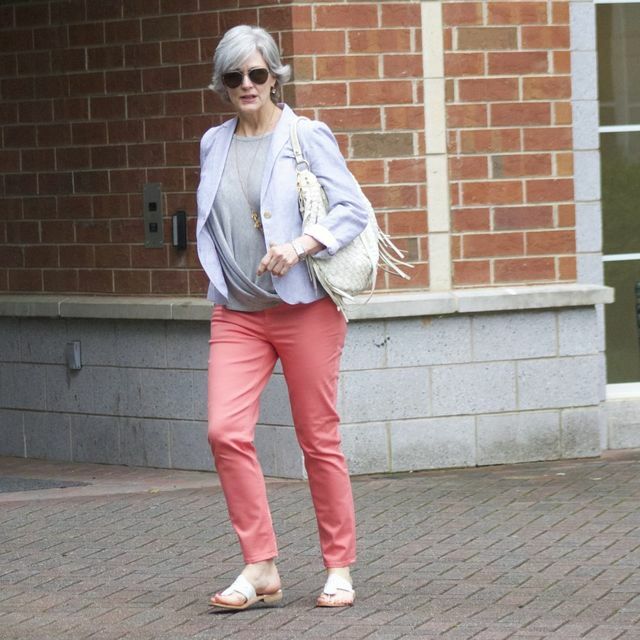 Casual outfits for 50 year old woman must radiate femininity and nonchalance. After all, you had decades to experiment with all the crazy trends. Now is the time to purchase basics and unique items that help you trust in your experience and refined taste. 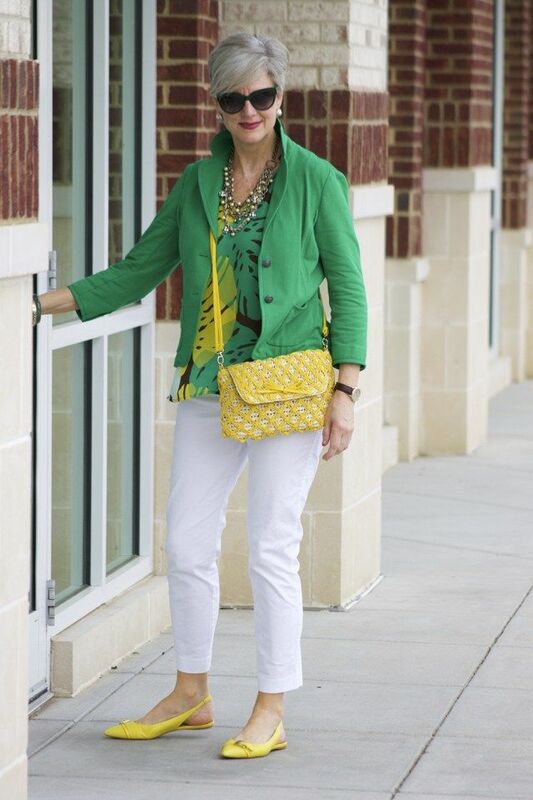 Styles for women over 50 continue to evolve, offering brand new ideas you can incorporate into your wardrobe. 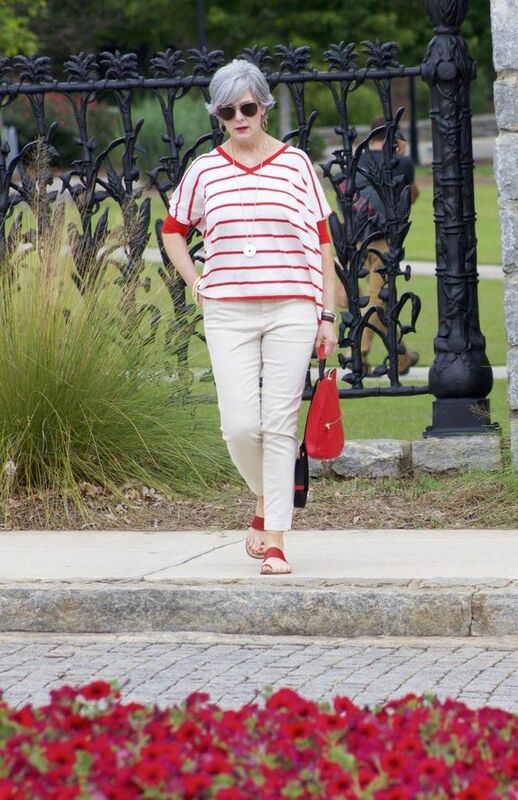 Purchasing a few basic items is a major priority for casual outfits for 50 year old woman. I have fallen in love with cropped flared pants, the denim dress and midi dresses complemented with a blazer or a jacket. No matter what shades you prefer, you’ll find these style essentials in your local stores. Let me a comment in order to know your opinion about these casual outfits for 50 year old woman. I would love to hear it. Great post! I loved all the featured looks! Best wishes for you dear!!! Thank you very much for your comment, Wendy. Your pictures inspire women of all ages. Thank you, Wendy 🙂 ! This was great! My eye gravitated immediately towards this article because there seems to be very slim good style advice for older woman. Thank you, Lucia! 🙂 Your comments means a lot for me!!! Very good articule. Thank you! I loved most of the outfits. I could see myself wearing them and many of them were “spot-on” my style! Oh, I love the ponchos! Wore them in the ’70’s. Thank you, Jackie!!! 🙂 I wear them today 🙂 !